We have all seen the “bargain bin” of cheap dog toys at the local pet store and picked one up for our pet without thinking. Seasonal toys that make us feel like we’re providing our pet with a bit of “holiday cheer.” Unfortunately, many of those toys are not good for our pets. Putting a bit more thought and care into the toys that we buy for our four-legged family members can make a big difference. New Bedford pet owners should understand that toys are important to the well-being of their dog. They provide them with an activity, something to do when they are feeling nervous or at home by themselves. They can be a way to get out behavior problems without getting into real trouble. And toys can also encourage active play, something that all dogs need to engage in throughout their lives. The first thing you need to do is learn about the safety of the toy that you are considering for your dog. Your local Dartmouth animal hospital could tell you many stories about dogs who were seriously injured due to playing with unsafe toys. A lot of the safety issues will depend upon the environment in which your dog plays with the toy, as well as the size of the dog, and the way that the dog uses the toy in play. Some toys suggest that they can improve canine dental care. However, others may be dangerous to your dog’s teeth, ultimately requiring advanced dentistry in Dartmouth to repair the damage. Dogs are often attracted to the very types of things that can cause them the most harm, such as rubber bands, ribbons, string, pantyhose, and small children’s toys. The toys should be the appropriate size for the dog. If a toy is too little, it can become lodged in the dog’s throat. Squeaking toys have a “squeaker” inside that is small and can be swallowed, which is why it is recommended for your dog to only play with this type of toy when being supervised. If your dog is a “chewer,” look for “dog proof” toys such as the Kong brand and other trusted brands that are rated based on the dog’s size and chewing abilities. 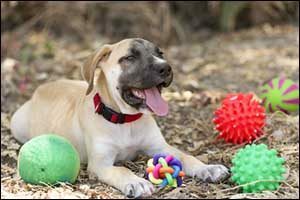 Find toys that will encourage activity in your dog, such as tug-of-war toys, textured chewing toys, balls, treat-filled distraction toys, busy box toys, and toys that you can take outside and play with together. Think of the action that you want for your dogs, such as running, learning how to fetch, chasing, or any other activity that will help to occupy their mind and physically tire them out. Many breeds require daily activity to help them with behavioral issues, so work with your local Dartmouth animal hospital to figure out the level of activity that is needed. Some toys do focus on canine dental care, such as chewing toys and textured toys. New Bedford pet owners can speak with their veterinarian or an expert in advanced dentistry in Dartmouth, to find out which toys are the best for dental issues. Avoid treats that claim to assist in canine dental care, unless your veterinarian specifically recommends them. Rawhide, bones, and other treats are frequently reported in the media as causing injury, sickness, and even death in pets due to their country of origin and other related safety issues. Dogs of all sizes want stuffed toys for comfort. Little dogs will often stock-pile them in their beds to hold, carry around, chew on, and even sleep on like a pillow as a source of comfort. Bigger dogs will often enjoy stuffed toys to shake around and “kill” when they are nervous or frustrated, so it is important to make sure that the comfort toys that you choose are the right size and strength to stand up to whatever it is that your dog wants to do with them. Even little dogs will shake toys around and be rough with them from time to time, so be aware of the way that they play with the toys and supervise them as much as possible whenever you bring a new toy into the house. For tips and information on the best toys for your dog, visit your local veterinarian at the Dartmouth animal hospital. In addition to essential veterinary check-ups, preventive treatments, vaccinations, and canine dental care, Anchor Animal Hospital offers a broad range of veterinary services. Whether your dog requires surgery and pain management, routine care, or advanced dentistry in Dartmouth, you can count on our veterinary team to provide everything you need to keep him healthy for many years to come. Give us a call at 508-996-3731 to schedule an appointment or to learn more about the services that we provide in Southeastern Massachusetts.